Help Barbie to prepare a beautiful surprise for her two gorgeous daughters. Pick a cute dress or a super hero costume for them and don t forget to choose some accessories. Have fun! It's time for rescueing the city! And the Disney princesses decided to do so. Choose the princess who will be in charge of helping the poor and dress her like a super hero! How will she look like? I bet stunning. 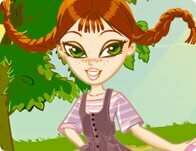 Help Pippi dress up for a new adventure. Short patchwork dress with oversize shoes are yours to discover and apply to this little hero.